This past week, JPMorgan Chase posted incredibly strong second-quarter earnings. Does this news indicate that the worst of the current financial crisis is over? Have we all been saved from a total collapse of life as we know it? Probably not...but these eye-opening times certainly bear further contemplation. Here is a link to an article titled The Great American Bubble Machine by Matt Taibbi for Rolling Stone that everyone is abuzz over. Creative individuals are often naive about the financial axis upon which the earth rotates. Where do you stand in the economic food chain? 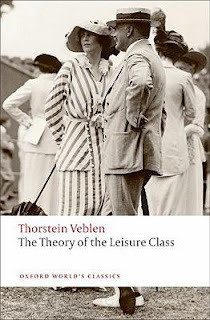 Way back in 1899, the economist and educator Thorstein Veblen wrote The Theory of the Leisure Class and laid out his analytical findings in a clear manner for all to read. It's difficult to be truthful to oneself sometimes, but who or what do you see when you look into a mirror? Are you happy? Are you a master of manipulation or one of the easily manipulated? Or, are you one of those rare breeds who thinks there must be something more to life than this? The theoretical physicist Stephen Hawking, while speaking about the idea of finding life elsewhere in the universe, said that he prefers to believe "Primitive life is very common and intelligent life is fairly rare. Some would say it has yet to occur on earth." 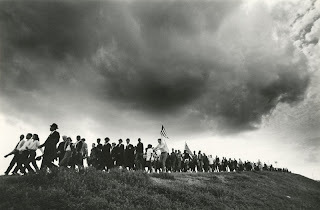 "When the community passes from peaceable savagery to a predatory phase of life, the conditions of emulation change. The opportunity and the incentive to emulation increase greatly in scope and urgency. The activity of the men more and more takes on the character of exploit; and an invidious comparison of one hunter or warrior with another grows continually easier and more habitual. Tangible evidences of prowess - trophies - find a place in men's habits of thought as an essential feature of the paraphernalia of life. Booty, trophies of the chase or of the raid, come to be prized as evidence of preeminent force. Aggression becomes the accredited form of action, and booty serves as prima facie evidence of successful aggression. As accepted at this cultural stage, the accredited, worthy form of self-assertion is contest; and useful articles or services obtained by seizure or compulsion, serve as a conventional evidence of successful contest. Therefore, by contrast, the obtaining of goods by other methods than seizure comes to be accounted unworthy of man in his best estate. The performance of productive work, or employment in personal service, falls under the same odium for the same reason. An invidious distinction in this way arises between exploit and acquisition by seizure on the one hand and industrial employment on the other hand. Labour acquires a character of irksomeness by virtue of the indignity imputed to it." "The ownership of women begins in the lower barbarian stages of culture, apparently with the seizure of female captives. The original reason for the seizure and appropriation of women seems to have been their usefulness as trophies. The practice of seizing women from the enemy as trophies, gave rise to a form of ownership-marriage, resulting in a household with a male head. This was followed by an extension of slavery to other captives and inferiors, besides women, and by an extension of ownership-marriage to other women than those seized from the enemy. The outcome of emulation under the circumstances of a predatory life, therefore, has been on the one hand a form of marriage resting on coercion, and on the other hand the custom of ownership. The two institutions are not distinguishable in the initial phase of their development; both arise from the desire of the successful men to put their prowess in evidence by exhibiting some durable result of their exploits. Both also minister to that propensity for mastery which pervades all predatory communities. From the ownership of women the concept of ownership extends itself to include the products of their industry, and so there arises the ownership of things as well as of persons." "Gradually, as industrial activity further displaces predatory activity in the community's everyday life and in men's habits of thought, accumulated property more and more replaces trophies of predatory exploit as the conventional exponent of prepotence and success. With the growth of settled industry, therefore, the possession of wealth gains in relative importance and effectiveness as a customary basis of repute and esteem. ..... Its possession in some amount becomes necessary in order to any reputable standing in the community. It becomes indispensable to accumulate, to acquire property, in order to retain one's good name. ..... Wealth is now itself intrinsically honourable and confers honour on its possessor. By a further refinement, wealth acquired passively by transmission from ancestors or other antecedents presently becomes even more honorific than wealth acquired by the possessor's own effort..."
"...So far as concerns the present question, the end sought by accumulation is to rank high in comparison with the rest of the community in point of pecuniary strength. So long as the comparison is distinctly unfavourable to himself, the normal, average individual will live in chronic dissatisfaction with his present lot; and when he has reached what may be called the normal pecuniary standard of the community, or of his class in the community, this chronic dissatisfaction will give place to a restless straining to place a wider and ever-widening pecuniary interval between himself and this average standard..."
"...So much so that there are few of the better class who are not possessed of an instinctive repugnance for the vulgar forms of labour. We have a realising sense of ceremonial uncleanness attaching in an especial degree to the occupations which are associated in our habits of thought with menial service. It is felt by all persons of refined taste that a spiritual contamination is inseparable from certain offices that are conventionally required of servants. 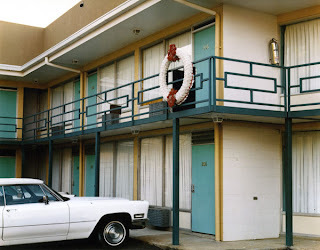 Vulgar surroundings, mean (that is to say, inexpensive) habitations, and vulgarly productive occupations are unhesitatingly condemned and avoided. 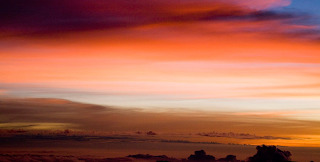 They are incompatible with life on a satisfactory spiritual plane - with "high thinking." "The knowledge and habit of good form come only by long-continued use. Refined tastes, manners, and habits of life are a useful evidence of gentility, because good breeding requires time, application, and expense, and can therefore not be compassed by those whose time and energy are taken up with work. A knowledge of good form is prima facie evidence that that portion of the well-bred person's life which is not spent under the observation of the spectator has been worthily spent in acquiring accomplishments that are of no lucrative effect..."
"...but the same is not true of the code of proprieties. These latter are expressions of status. It is of course sufficiently plain, to any one who cares to see, that our bearing towards menials and other pecuniarily dependent inferiors is the bearing of the superior member in a relation of status, though its manifestation is often greatly modified and softened from the original expression of crude dominance. Similarly, our bearing towards superiors, and in great measure towards equals, expresses a more or less conventionalised attitude of subservience. Witness the masterful presence of the high-minded gentleman or lady, which testifies to so much of dominance and independence of economic circumstances, and which at the same time appeals with such convincing force to our sense of what is right and gracious. It is among this highest leisure class, who have no superiors and few peers, that decorum finds its fullest and maturest expression; and it is this highest class also that gives decorum that definitive formulations which serves as a canon of conduct for the classes beneath. And here also the code is most obviously a code of status and shows most plainly its incompatibility with all vulgarly productive work. A divine assurance and an imperious complaisance, as of one habituated to require subservience and to take no thought for the morrow, is the birthright and the criterion of the gentleman at his best; and it is in popular apprehension even more than that, for this demeanour is accepted as an intrinsic attribute of superior worth, before which the base-born commoner delights to stoop and yield." "...The leisure class stands at the head of the social structure in point of reputability; and its manner of life and its standards of worth therefore afford the norm of reputability for the community. The observance of these standards, in some degree of approximation, becomes incumbent upon all classes lower in the scale. In modern civilized communities the lines of demarcation between social classes have grown vague and transient, and wherever this happens the norm of reputability imposed by the upper class extends its coercive influence with but slight hindrance down through the social structure to the lowest strata. The result is that the members of each stratum accept as their ideal of decency the scheme of life in vogue in the next higher stratum, and bend their energies to live up to that ideal. On pain of forfeiting their good name and their self-respect in case of failure, they must conform to the accepted code, at least in appearance." "...Conspicuous consumption claims a relatively larger portion of the income of the urban than of the rural population, and the claim is also more imperative. The result is that, in order to keep up a decent appearance, the former habitually live hand-to-mouth to a greater extent than the latter. So it comes, for instance, that the American farmer and his wife and daughters are notoriously less modish in their dress, as well as less urbane in their manners, than the city artisan's family with an equal income. It is not that the city population is by nature much more eager for the peculiar complacency that comes of a conspicuous consumption, nor has the rural population less regard for pecuniary decency. But the provocation to this line of evidence, as well as its transient effectiveness, are more decided in the city. This method is therefore more readily resorted to, and in the struggle to outdo one another the city population push their normal standard of conspicuous consumption to a higher point, with the result that a relatively greater expenditure in this direction is required to indicate a given degree of pecuniary decency in the city. The requirement of conformity to this higher conventional standard becomes mandatory. The standard of decency is higher, class for class, and this requirement of decent appearance must be lived up to on pain of losing caste." "...The question is further complicated by the fact that many objects, as, for instance, the precious stones and metals and some other materials used for adornment and decoration, owe their utility as objects of beauty. Gold, for instance, has a high degree of sensuous beauty; very many if not most of the highly prized works of art are intrinsically beautiful, though often with material qualification; the like is true of some stuffs used for clothing, of some landscapes, and of many other things in less degree. Except for this intrinsic beauty which they possess, these objects would scarcely have been coveted as they are, or have become monopolised objects of pride to their possessors and users. But the utility of these things to the possessor is commonly due less to their intrinsic beauty than to the honour which their possession and consumption confers, or to the obloquy which it wards off." "Apart from this general control exercised by the norm of conspicuous waste over the ideal of feminine beauty, there are one or two details which merit specific mention as showing how it may exercise and extreme constraint in detail over men's sense of beauty in women. It has already been noticed that at the stages of economic evolution at which conspicuous leisure is much regarded as a means of good repute, the ideal requires delicate and diminutive hands and feet and a slender waist. These features, together with the other, related faults of structure that commonly go with them, go to show that the person so affected is incapable of useful effort and must therefore be supported in idleness by her owner. She is useless and expensive, and she is consequently valuable as evidence of pecuniary strength. It results that at this cultural stage women take thought to alter their persons, so as to conform more nearly to the requirements of the instructed taste of the time; and under the guidance of the canon of pecuniary decency, the men find the resulting artificially induced pathological features attractive. So, for instance, the constricted waist which has had so wide and persistent a vogue in the communities of the Western culture, and so also the deformed foot of the Chinese. Both of these are mutilations of unquestioned repulsiveness to the untrained sense. ..... They are items of pecuniary and cultural beauty which have come to do duty as elements of the ideal of womanliness." "...But dress has subtler and more far-reaching possibilities than this crude, first-hand evidence of wasteful consumption only. If, in addition to showing that the wearer can afford to consume freely and uneconomically, it can also be shown in the same stroke that he or she is not under the necessity of earning a livelihood, the evidence of social worth is enhanced in a very considerable degree. Our dress, therefore, in order to serve its purpose effectually, should not only be expensive, but it should also make plain to all observers that the wearer is not engaged in any kind of productive labour. ..... It goes without saying that no apparel can be considered elegant, or even decent, if it shows the effect of manual labour on the part of the wearer, in the way of soil or wear. ..... Elegant dress serves its purpose of elegance not only in that it is expensive, but also because it is the insignia of leisure. It not only shows that the wearer is able to consume a relatively large value, but it argues at the same time that he consumes without producing." "The dress of women goes even farther than that of men in the way of demonstrating the wearer's abstinence from productive employment. It needs no argument to enforce the generalisation that the more elegant styles of feminine bonnets go even farther towards making work impossible than does the man's high hat. The woman's shoe adds the so-called French heel to the evidence of enforced leisure afforded by its polish; because this high heel obviously makes any, even the simplest and most necessary manual work extremely difficult. The like is true even in a higher degree of the skirt and the rest of the drapery which characterises woman's dress. The substantial reason for our tenacious attachment to the skirt is just this: it is expensive and it hampers the wearer at every turn and incapacitates her for all useful exertion. The like is true of the feminine custom of wearing the hair excessively long." "There is a marked similarity in these respects between the apparel of women and that of domestic servants, especially liveried servants. In both there is a very elaborate show of unnecessary expensiveness, and in both cases there is also a notable disregard of the comfort of the wearer. But the attire of the lady goes farther in its elaborate insistence on the idleness, if not on the physical infirmity of the wearer, than does that of the domestic. And this is as it should be; for in theory, according to the ideal scheme of the pecuniary culture, the lady of the house is the chief menial of the household." "The leisure class is in great measure sheltered from the stress of those economic exigencies which prevail in any modern, highly organised industrial community. The exigencies of the struggle for the means of life are less exacting for this class than for any other; and as a consequence of this privileged position we should expect to find it one of the least responsive of the classes of society to the demands which the situation makes for a further growth of institutions and a readjustment to an altered industrial situation. The leisure class is the conservative class. The exigencies of the general economic situation of the community do not freely or directly impinge upon the members of this class. They are not required under penalty of forfeiture to change their habits of life and their theoretical views of the external world to suit the demands of an altered industrial technique, since they are not in the full sense an organic part of the industrial community. Therefore these exigencies do not readily produce, in the members of this class, that degree of uneasiness with the existing order which alone can lead any body of men to give up views and methods of life that have become habitual to them. The office of the leisure class in social evolution is to retard the movement and to conserve what is obsolescent. This proposition is by no means novel; it has long been one of the commonplaces of popular opinion." "From this proposition it follows that the institution of a leisure class acts to make the lower classes conservative by withdrawing from them as much as it may of the means of sustenance, and so reducing their consumption, and consequently their available energy, to such a point as to make them incapable of the effort required for the learning and adoption of new habits of thought. The accumulation of wealth at the upper end of the pecuniary scale implies privation at the lower end of the scale. It is a commonplace that, wherever it occurs, a considerable degree of privation among the body of the people is a serious obstacle to any innovation." "Their (leisure class) office is of a parasitic character, and their interest is to divert what substance they may to their own use, and to retain whatever is under their hand. The conventions of the business world have grown up under the selective surveillance of this principle of predation or parasitism. 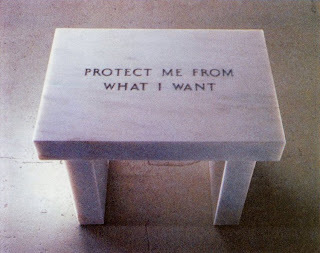 They are conventions of ownership; derivatives, more or less remote, of the ancient predatory culture." "The most immediate and unequivocal expression of that archaic human nature which characterises man in the predatory stage is the fighting propensity proper. In cases where the predatory activity is a collective one, this propensity is frequently called the martial spirit, or latterly, patriotism. It needs no insistence to find assent to the proposition that in the countries of civilised Europe the hereditary leisure class is endowed with this martial spirit in a higher degree than the middle classes. Indeed, the leisure class claims the distinction as a matter of pride, and no doubt with some grounds. War is honourable, and warlike prowess is eminently honorific in the eyes of the generality of men; and this admiration of warlike prowess is itself the best voucher of a predatory temperament in the admirer of war. The enthusiasm for war, and the predatory temper of which it is the index, prevail in the largest measure among the upper classes, especially among the hereditary leisure class. Moreover, the ostensible serious occupation of the upper class is that of government, which, in point of origin and developmental content, is also a predatory occupation." "But all these innovative programs and expanded opportunities will not, in and of themselves, make a difference if each of us, as parents and community leaders, fail to do our part by encouraging excellence in our children. Government programs alone won't get our children to the Promised Land. We need a new mindset, a new set of attitudes - because one of the most durable and destructive legacies of discrimination is the way that we have internalized a sense of limitation; how so many in our community have come to expect so little of ourselves." "We have to say to our children, Yes, if you're African American, the odds of growing up amid crime and gangs are higher. Yes, if you live in a poor neighborhood, you will face challenges that someone in a wealthy suburb does not. But that's not a reason to get bad grades, that's not a reason to cut class, that's not a reason to give up on your education and drop out of school. No one has written your destiny for you. Your destiny is in your hands - and don't you forget that. To parents, we can't tell our kids to do well in school and fail to support them when they get home. For our kids to excel, we must accept our own responsibilities. That means putting away the Xbox and putting our kids to bed at a reasonable hour. It means attending those parent-teacher conferences, reading to our kids, and helping them with their homework. And it means we need to be there for our neighbor's son or daughter, and return to the day when we parents let each other know if we saw a child acting up. That's the meaning of community. That's how we can reclaim the strength, the determination, the hopefulness that helped us come as far as we already have. It also means pushing our kids to set their sights higher. They might think they've got a pretty good jump shot or a pretty good flow, but our kids can't all aspire to be the next LeBron or Lil Wayne. I want them aspiring to be scientists and engineers, doctors and teachers, not just ballers and rappers. I want them aspiring to be a Supreme Court Justice. I want them aspiring to be President of the United States. So, yes, government must be a force for opportunity. Yes, government must be a force for equality. But ultimately, if we are to be true to our past, then we also have to seize our own destiny, each and every day." 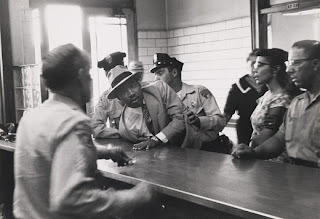 "It is a simple dream, and yet one that has been denied - one still being denied - to so many Americans. It's a painful thing, seeing that dream denied. I remember visiting a Chicago school in a rough neighborhood as a community organizer, and thinking how remarkable it was that all of these children seemed so full of hope, despite being born into poverty, despite being delivered into addiction, despite all the obstacles they were already facing. And I remember the principal of the school telling me that soon all of that would begin to change; that soon, the laughter in their eyes would begin to fade; that soon, something would shut off inside, as it sunk in that their hopes would not come to pass - not because they weren't smart enough, not because they weren't talented enough, but because, by accident of birth, they didn't have a fair chance in life." Anna and I are very happy to present our new 264-page online travel guide for the incredible Big Island of Hawaii. Follow this link to the Trips of Wonder website and immerse yourself in our fun and free guidebooks. 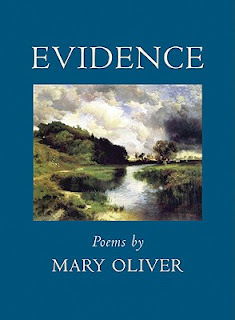 Thank you to the young filmmaker Sophia Pande for the recent gift of Evidence, Poems by Mary Oliver, published by Beacon Press, 2009. It was a timely read because in the July 5, 2009 edition of the New York Times, Mary Duenwald writes of the poet in her article The Land and Words of Mary Oliver, the Bard of Provincetown. It's also timely because I want to wish the artist David Carrino (often of Provincetown) a happy and memorable birthday today. Ms. Duenwald writes that the poet first "moved to Provincetown to be with the woman she loved, and to whom she has dedicated her books of poetry, Molly Malone Cook." The article goes on to say "this small patch of earth, a two-mile-long smattering of a dozen or so freshwater ponds on the northwest tip of Cape Cod, is where Mary Oliver, a Pulitzer Prize-winning poet who has a devoted audience, has set most of her poetry since she arrived in Provincetown in the 1960s." Here is a link to the article's audio slide show with Ms. Oliver reading At Blackwater Pond and The Sun, with photographs by Andrea Mohin. For myself, I have spent my life clamoring toward it. Halleluiah, anyway I'm not where I started! and how miraculously kind some people can be? It's the Fourth of July, and we know that we should be thinking of hamburgers and Coney Island hot dog eating contests, but lately we've got Asian noodles on our mind. Here in New York, even the most unsophisticated eaters have an opportunity to graduate from a simple wonton noodle soup, chow mein or pad thai to a Filipino pansit, Vietnamese pho, or the delicious Malaysian char kway teow. Of course, this love affair started when we were much younger. 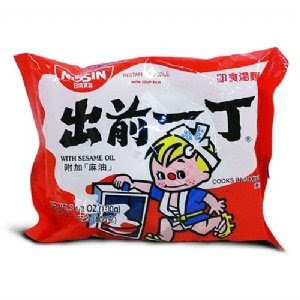 Beginning in the 1970s, Americans were first introduced to dry instant noodle brands such as Cup Noodles or Top Ramen by the Nissin Foods Company. Strangely, the famous Doll brand noodles or Demae Itcho brand noodles sold in Asia always came with better tasting spices and much better looking packaging than their American counterparts. Aesthetics aside, we can vouch for a fact that when we were penniless college art students, those funky Maruchan brand noodles (sometimes 7 for a dollar!) got us through some very tough times. Thankfully the taste for noodles never leaves you, and when living in Hawaii years later, we were so happy to discover saimin noodles and the award-winning Hamura's Saimin Stand on Kauai. Lately, we've been taste-testing the very spicy Shin Ramyun and Neoguri packaged noodles produced by the Korean company Nong Shim. Poor college art students take note: look for these better brands at your Asian grocer and we think you'll agree that instant noodles have indeed stepped it up a couple of notches! We do want to thank the designer Joshua Distler for introducing us to Soba-ya in the East Village this past week, and Darren Namaye of Ideas On Purpose for pointing us in the direction of Hakata Ippudo NY recently. It seems like noodles, especially freshly made ramen noodle soups, are enjoying a big renaissance moment here in Manhattan. Everywhere you turn, newspapers, blogs, and foodies are talking about the delicious and life-affirming noodle and broth concoctions at local restaurants such as Momofuku, Ramen Setagaya, Rai Rai Ken, Minca Ramen Factory and Ippudo NY. And so it is we bring to your attention the classic 1985 Japanese comedy film Tampopo, starring Nobuko Miyamoto, Ken Watanabe, and Koji Yakusho. Talk about a love affair with food and noodles, this art house favorite religiously worships everything ramen. As the Ramen Master suggests in the film, "Appreciate its gestalt." Hopefully, his experience and advice will help you on your way to finding inner peace and the best darn bowl of noodles in the city. Who knows, we may even cross paths one day as you can often find us hunkered down at Sapporo East's bar (East 10th Street) slurping dreamily away at our heavenly tempura udon. Please save our seats for us! Recently available for bidding at Auction SITE 2009, with proceeds helping to support the exhibitions, education and public programs of SITE Santa Fe. Retail value $75,000. 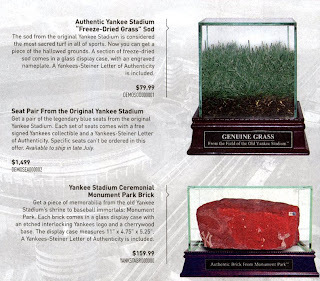 "On the following pages, you'll find just a few of the one-of-a-kind Yankee Stadium items that Steiner Sports is offering in partnership with The New York Times Store. Significantly, each and every item has been carefully vetted by the Steiner experts using the company's proprietary methods of authentication. "We're not letting a lot of vendors sell this stuff because we're not secure that most would handle it with the respect and accountability we want," says Steiner. "So people aren't going to find these items in a lot of places." The Steiner Sports motto - The Steiner Seal Means It's Real - is much more than a slogan. It's a promise." The sod from the original Yankee Stadium is considered the most sacred turf in all of sports. Now you can get a piece of the hallowed grounds. A section of freeze-dried sod comes in a glass display case, with an engraved nameplate. A Yankees-Steiner Letter of Authenticity is included. Get a piece of memorabilia from the old Yankee Stadium's shrine to baseball immortals: Monument Park. Each brick comes in a glass display case with an etched interlocking Yankees logo and a cherrywood base. The display case measures 11" x 4/75" x 5.25". A Yankees-Steiner Letter of Authenticity is included.